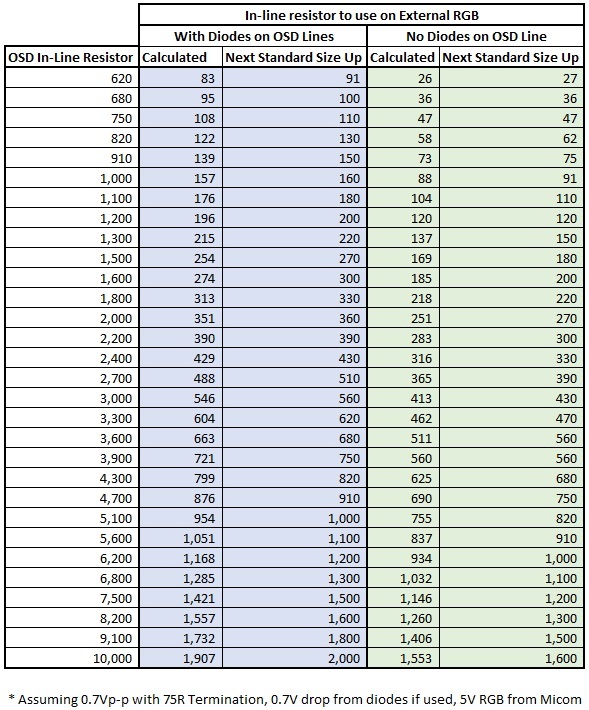 24 series prior to 51 termination (should be exactly .5vpp): as low as the original 75 term by itself. I really, really want to find a data sheet that actually has the levels spelled out. Worst of all, the bar was slightly more prevalent than it was with the 33/75 combo. Disconnected the ground line and it was still there, so I don't think it's that. Input lines from jack to switch and switch to IC are as short as can be, don't THINK it's that... starting to wonder if it's something to do with the blanking being tied 5V high? Otherwise out of ideas and might have to try to live with it. EDIT: Little update; got bold and reassembled it anyway; between the one half of the clip and the suction cup, it feels fairly secure. Still functional, though unsure of the long term safety of that. I played with pots on the RGB lines and have them at a happy place, but the right side ripple that fades in and out on certain colors persists. I believe I've isolated it to the blanking line coming from the 5v regulator; it's there even when only that's connected. 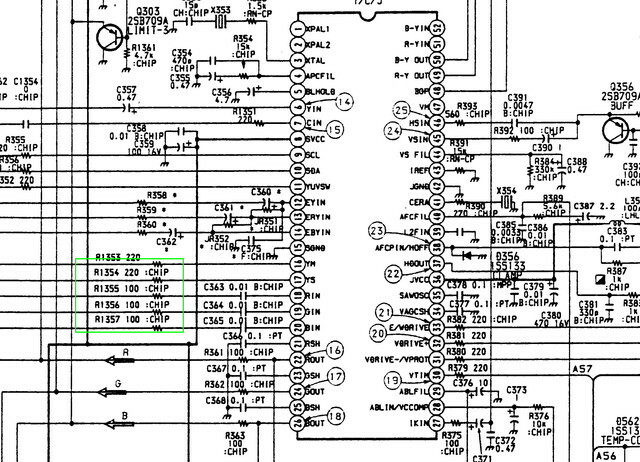 I tried running from the D-VCC pin 18 that the manual says is supposed to have 4.7v, and the ripple was no longer noticeable, however it wasn't enough to blank; also turns out the actual voltage measured was 3.3. Found a different 5v regulator on the PIP board and tried it, and it ALSO couldn't blank, but it DID cause the ripple anyway! Measured it and turned out it was only outputting 4.7v, so it seems right at 5 is the sweet spot... and also seems like I just have inordinately noisy regulators. 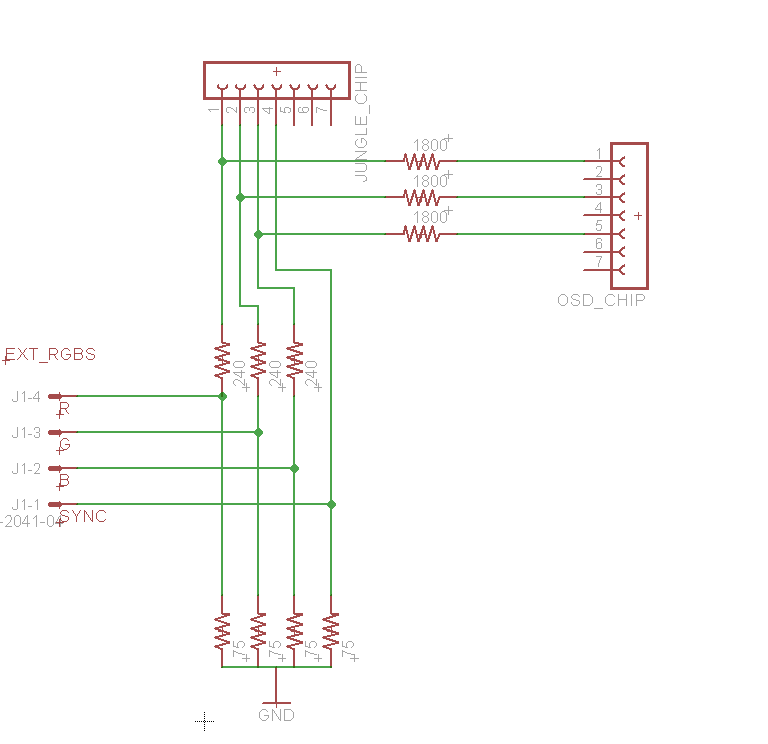 Anyone ever tried making some sort of LC filter for the 5v output (or had a need to)? Or should I just tie it high to the pin 46 9v VCC and hope A) it's better filtered and B) it doesn't fry? That's about the only thing left that could go wrong with this little project! EDIT 2: Tried to filter the 5v regulator output with a little circuit of 10, 1, an 0.1 uf decoupling caps. No change. Did find out that I was wrong about the blanking voltage; mirrored the stock 6.8/3.3 k divider on the regulator output in addition to the filtering, taking it down to 1.7v, and it still blanked fine, but no change to that stubborn ripple. Must have shorted it somehow when I had it hooked up to the D-VCC previously? 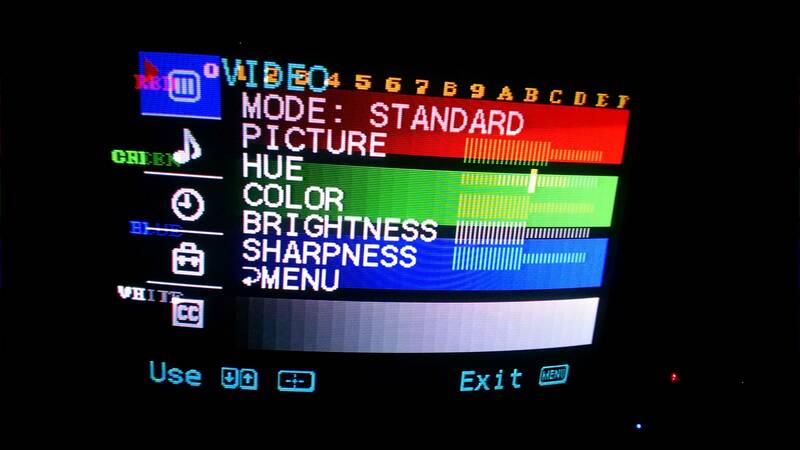 Picked up a panasonic TV (CT-9R11A) that has a menu using RGB lines. can't seem to figure out the blanking though, and also where to inject my SYNC as the set is antenna only. 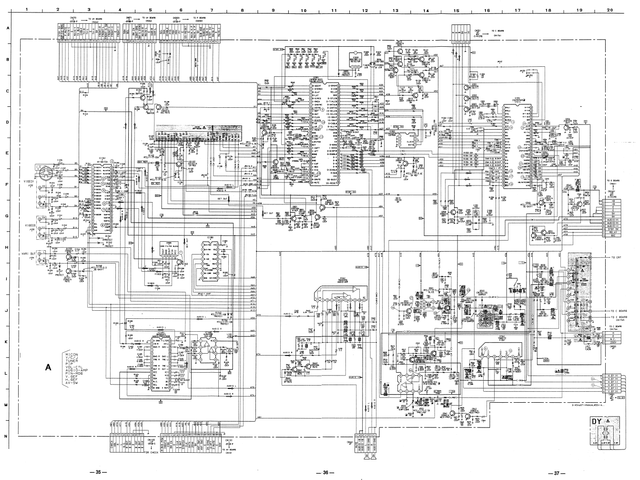 Here's a schematic I pulled from the service manual. 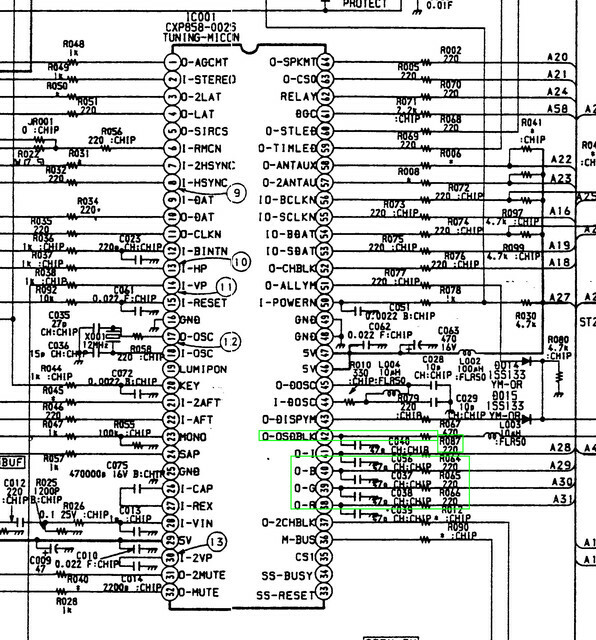 the pin that I think might be blanking, YC pin on the AN5163K Jungle IC disables the OSD when tied to ground. Haven't tried +5V yet. Any suggestions to disable the background static and just let the OSD RGB show through? And where do i tap into to bypass the tuner? Pin 33 of AN5163K looks the goods for sync input. A pretty standard pattern for these chips is that they get fed IF in, they convert it internally then send the video out and return it back into themselves via the internal video pin. Blanking is YS input, pin 7. Requires 0.7V or more to blank. Should be able to do an OSD External RGB mux by removing resistors R611, R612 and R613 and injecting 75R terminated RGB in the holes left via 240R inline resistors. This is the exact info I was looking for. thanks so much! I'll be modding my set soon. 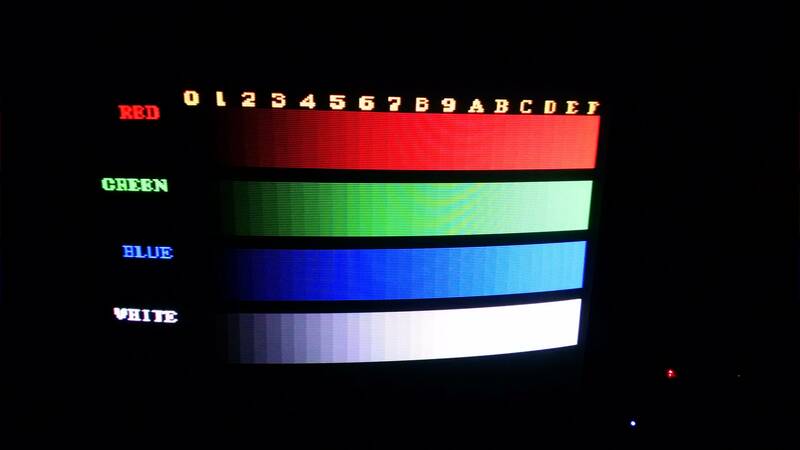 And, i can confirm that pin 33 is sync as I fed a composite test signal in there and saw a picture. did that, and I get a solid white image. Had to connect back the TV 680 ohm termination resistors to get my picture back. 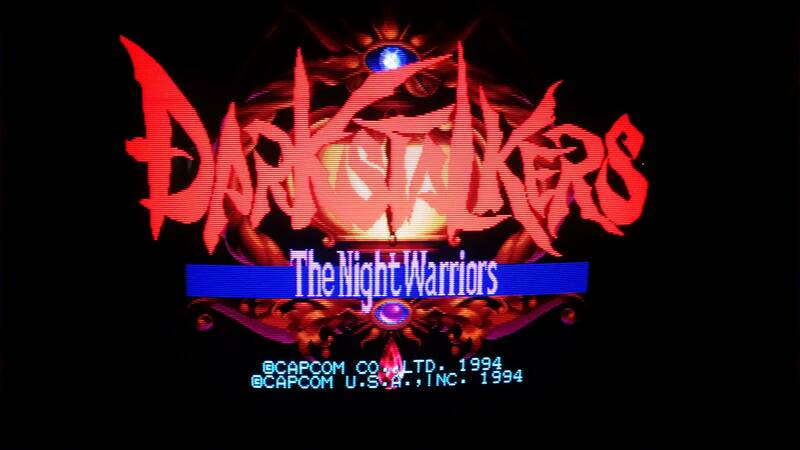 Also had to run the OSD in parallel with the image for now. so it appears transparent on top of the image, but is still readable. Any way to get the blacks to be darker? 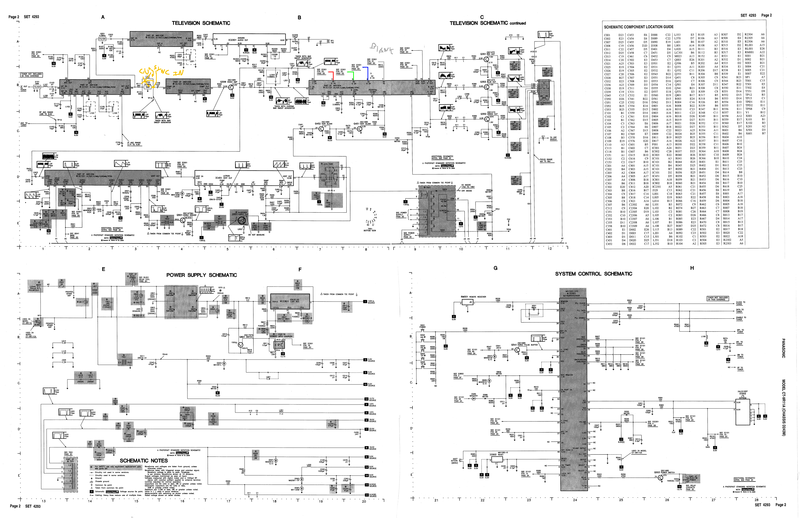 Did you follow the OSD mux diagram shown in my signature? 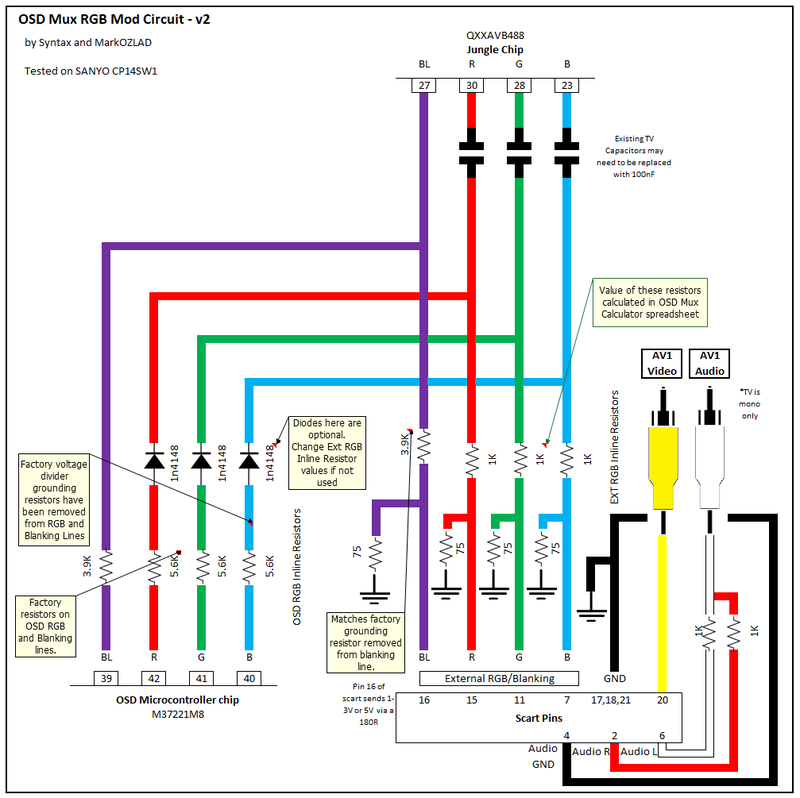 In the OSD mux method the OSD lines will terminate through the 240 ohms and 75 ohms that are on the external RGB lines. It makes no sense that "any termination other than the 680 ohms causes a white screen". This simply will not be the case. There will be something wrong with your implementation. 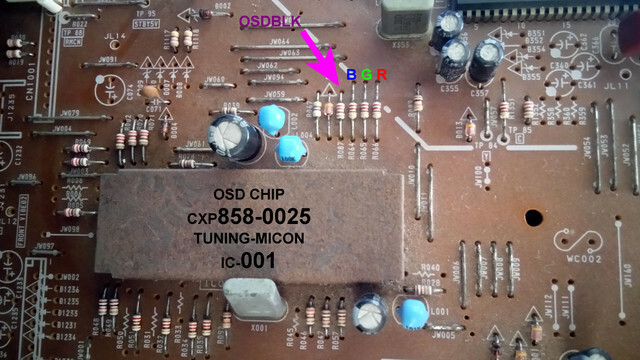 To implement the OSD mux when I have through-hole resistors on the OSD termination I use this simple method. For each of the RGB lines, I twist and solder the legs of a 240R (in your case) and a 75R together at one end, making a Y shape. I then solder the free leg of the 240R into the hole left by the removed resistor that "goes to the jungle" and the free leg of the 75R to the hole left by the removed resistor that is attached to ground. I then connect my RGB lines to the connected legs that will be sticking up. If you watch the 8 Bit Guy's CRT RGB mod video you will see he used the technique. that clears everything up, i'll give it a shot next time I have the TV open. this set uses surface mount parts, so it's a little trickier to solder, but i can manage. So, i desolder the 680 ohm terminations, and replace them with the 240/75 ohm with my external RGB coming in the middle of them? Just to verify, This is the circuit I'd use? 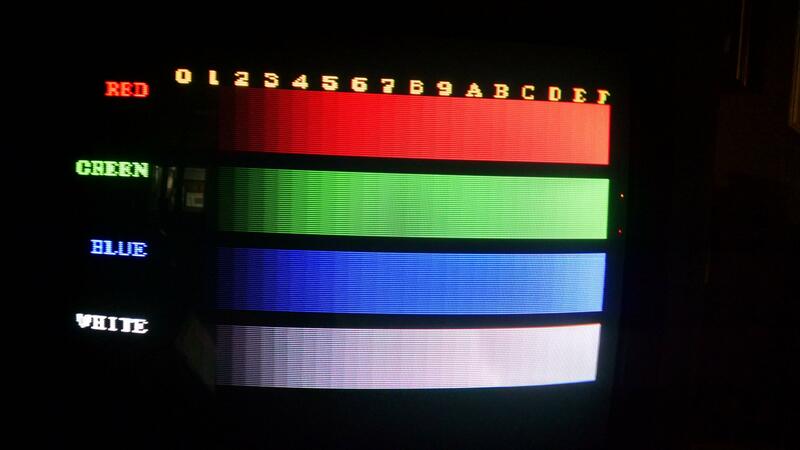 A while ago you and Syntax helped me with a Sony KV-27S22. Switch mod still working great. Thanks again! I'd like to upgrade to your mux alternative and was wondering if you could help me figure out the component values. Looking at the TV's service manual the RGB and blank lines for the OSD chip use 220 Ohms each. I tried using the resistor table but it starts at 620 Ohms. 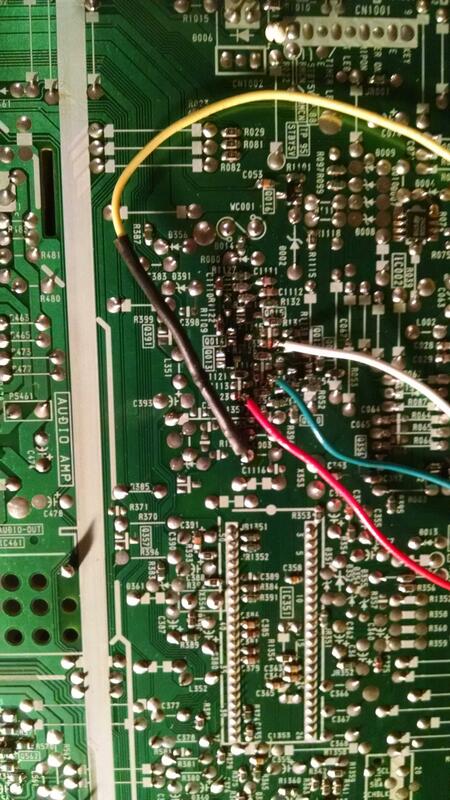 Also for this case I don't see a diode for these lines. Do I need them? I also don't know what resistor values I need for the external RGB/Blanking. On the board a schematic I see resistors R1355, R1356 and R1357 going to the jungle chip with 100 Ohm each. Then again I am not sure I am doing this right. Two post-mortems in rapid succession. 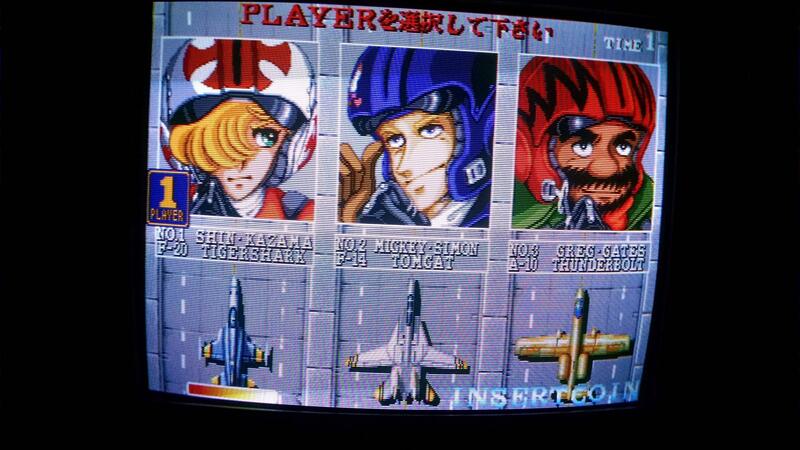 So first, Sharp 27N-S300. This was done purposefully as an OSD snip since its OSD does not naturally go away and it is destined for use in a MAME cabinet, so I want the ability to generally have it disabled. Long story short, I originally did this in a clean and more correct manner... then gradually desecrated the TV and Frankensteined it to a horrible extent in search of squashing the right side ripple effect I described, but never managed to photograph very effectively. The original injection points I used, which I'd recommend, are R2024 and R2025 for red and green, which are both conveniently large and thru-hole, and R2026 and R2027 for blue and blanking, which are on the opposite side of the board and SMD, but still workable. The less said about the state it's in now, the better (though entirely functional and pretty). 5V is pulled from the regulator, IC101. Originally I had blanking on the switch, but pulled it off and muxed those lines alone since I never intend to use the set for anything else; removed R802, put a 3.3k resistor on the 5V and connected it with the 6.8k one coming off the internal blank both to pin 14 of the Jungle. One quirk was that it seemed to like RGB to be closer to .5 than .7; levels were demonstrably brighter the closer to .5 I got, but terminating it with anything other than 75 ohm caused major issues. I ended up ultimately using 33 ohm series prior to the termination for best results. Nonetheless, still had to tweak up the cutoffs by about 20 points to get everything looking solid. The solution to my problem was that it wanted everything to be far, FAR away from the flyback... my switch and wires started a good 10 inches away, but moving the whole shebang another 2 inches to the left finally resolved that ripple effect, long after I'd torn everything up and rebuilt it a few times, up to and including pulling IC pins (and breaking one). Notwithstanding I'm worried that my anode clip now only has one half of the clip mechanism, it makes a beautiful picture now; my crappy camera can't do it justice. 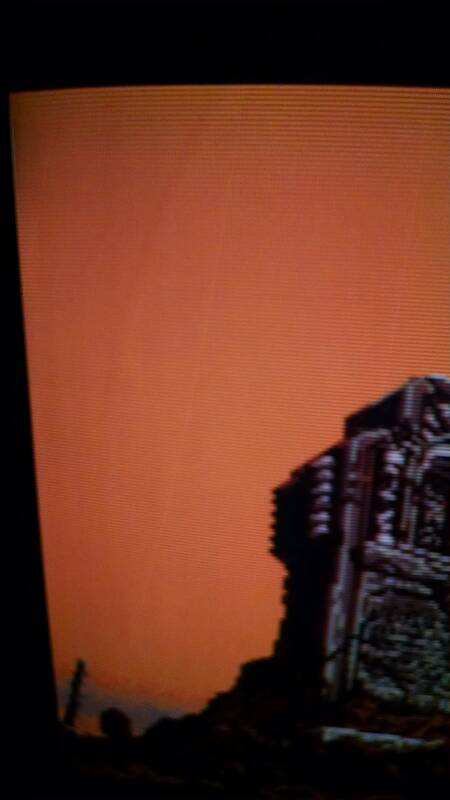 Line on the screen is just my camera acting up. Last edited by DJO_Maverick on Wed Apr 17, 2019 3:50 am, edited 1 time in total. 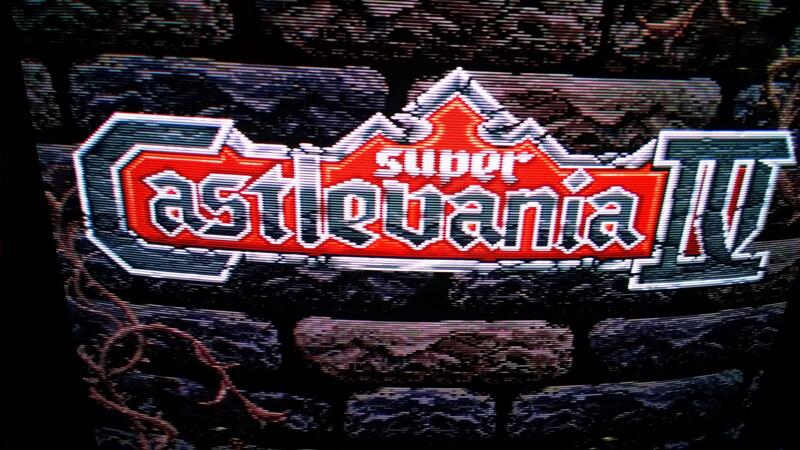 Second: Sony KV-32S22. This one was done as an OSD Mux with coaching from MarkOZLAD. This went infinitely smoother, despite teeny-tiny SMDs all the way. R1123, R1128, and R133 were all removed. External RGB lines were terminated with 75 ohm, then 330 ohm in series after, and connected to the ungrounded pads of the former grounding resistors. I pulled 5v from either pin 46 or 47 of the Micom (can't recall right now, there are two 5v pins right next to each other). Ran it through a 220 ohm resistor and tied it to the upstream leg of inductor L003. RGB lines were all run to BNC jacks, comp RCA input used for sync. 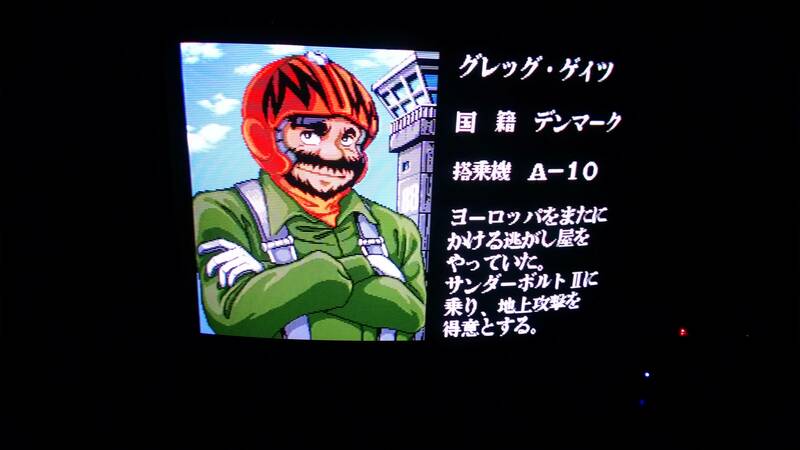 Excellent results out of the box; didn't need to adjust gain or cutoffs at all on this one. Not quite as glorious looking as the Sharp (red convergence is a tic off), but still grand and big. Couldn't have done it without help from Mark, much appreciated. Only kink I've run into is a faint 'arc' on the left side of the screen that is entirely static (not ripply like what I dealt with on the Sharp) but is only visible on certain (generally dim/dark) colors. You can see it to the left of the tombstone one screenshot; best I could get of it. I'm not sure what's causing it; I suspect it might again be some sort of HV interference, but I'm almost tempted to leave well-enough alone on this one, after the travesties I inflicted on the Sharp. EDIT: Actually one other kink, not sure if anyone has run into; it doesn't happen with RGB-Pi, RGB NES, or N64, only SNES. 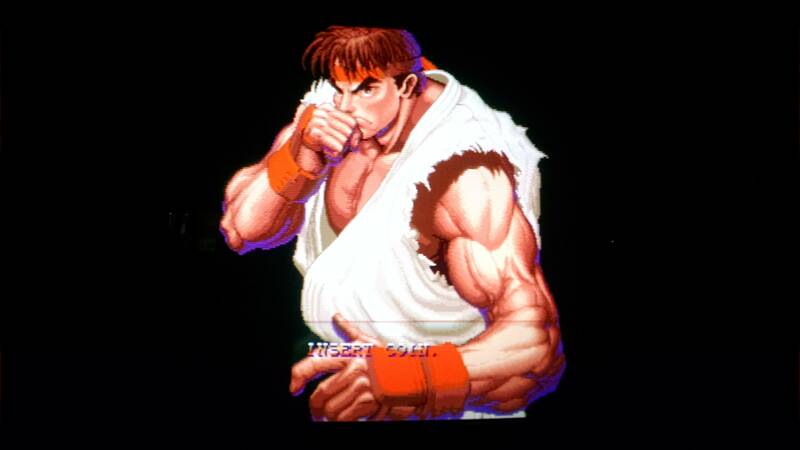 If the tv is already on and I turn on the SNES, it goes to a full white screen and stays that way... may eventually slowly recalibrate one color at a time back to a normal picture after minutes. This happens maybe 60% of the time, however, it can be worked around 100% of the time either by resetting the console or by turning the tv on AFTER the SNES is already on. 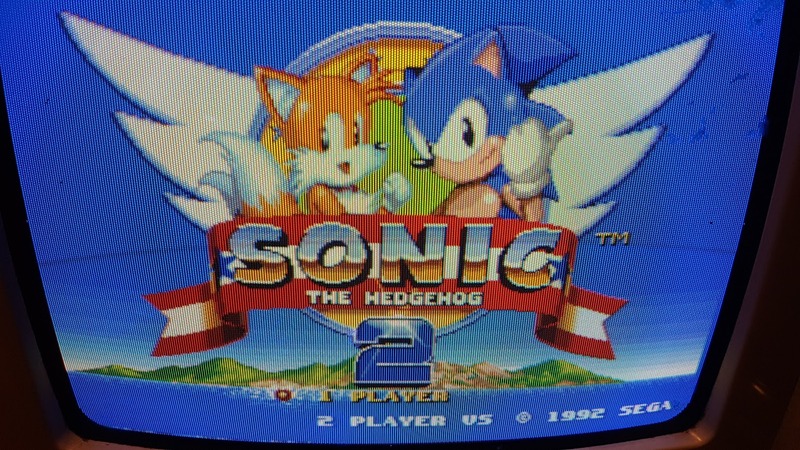 I suspect it's some sort of clamping problem; my SNES makes a white flash on the screen when it's initially powered on, and I think that's causing it, though it doesn't cause any issues on either my PVM or the Sharp. Any solutions to that annoyance? I'd like to upgrade to your mux alternative and was wondering if you could help me figure out the component values. Check out DJO_Maverick's post two below yours for his KV-32S22 that I helped him with. Should be same method. Happy to provide more info if needed. Very happy to help. I have been hoping someone would try an OSD External RGB Mux on the Sony AA-2D chassis. I had analysed this set many moons ago and had formulated my method but being in Australia I will never get my hands on one of these sets. The circuit on this set is quite different from most we encounter but in the end can be tackled in a near identical manner. Hopefully now a whole new class of sets can be saved from the dreaded OSD snip. Thank you but I don't understand what he's saying. I don't understand why he chose those spots and the signal he's diverting or injecting. I don't know what resistors I need to use and their values. I don't know how to proceed. Sorry if I sound dumb but the post is too generic for me to risk breaking a different (though apparently same board) model. The three resistors mentioned are SMD grounding resistors, one on each of the color lines. If unfamiliar, that means one pad is in the signal, and one pad goes to ground. If those resistors are removed, you turn the non-ground pad of each of them into an injection point. Each color line is terminated with a 75 ohm resistor to ground and then goes through a 330 ohm resistor, as described, to the non-ground pad left behind by the appropriate resistor. In my case, R133 was blue, R1123 was red, and R1128 was green. As for how the value of the replacement was calculated, you'd have to ask Mark; he handled the math. They're replacing 390 ground terminations, so they aren't far off. Likewise for his calculation of the 220 ohm resistor to use on the 5v source. You can find whatever 5v source you want, really... I just pulled one of the appropriate Micom pins because it was handy, and because the 5v regulator on this board is over on the high voltage side, and I didn't want to risk bringing any interference. The leg of that inductor is in the path of the OSD blanking signal, on its way over to the jungle. If you never intend to use the set for anything other than RGB again, hook it straight up to it. If you want the option to continue using other connection types, you'd need to run your 5v source through a SPDT switch, and then on to the inductor, that way you can turn off the full-screen blanking. Well at least it worked out for you. Thanks.